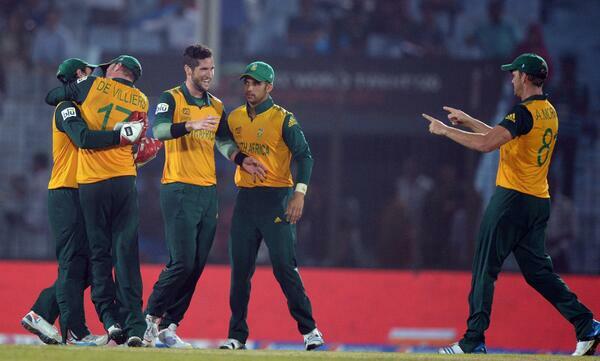 South Africa defeated England by just 3 runs to eliminate them from the 2014 World t20 Tournament. Many thought the South Africans were going to demolish England, but the Three Lions definitely gave South Africa a hard fight. South Africa one the toss and elected to bat first. At the end of their 20 overs, the South Africans managed to score a total of 196 runs, with just 5 wickets being conceded. AB de Villiers and Hashim Amla were the two stand out batsman in the innings, with de Villiers knocking 69 runs off just 28 balls, and Amla scoring 56 runs off 37 balls. The England wicket takers were Tim Bresnan, Chris Jordan, Stuart Broad, and spinner bowler, James Tredwell. SA also conceded another wicket to Ravi Bopara, one got rid of Duminy with a run out. A strong innings from South Africa dented England's hopes of chasing the total down. England started their batting innings fairly strong, with openers Alex Hales and Michael Lumb creating a solid 46 run partnership, until Lumb was caught by Miller off the bowling of Parnell. Ali scored just 10 for England, Morgan scored 14, and Buttler knocked a total of 34 runs. After being 175-7 in 19.1 overs, England still needed a fair few amount of runs, and it seemed very unlikely. And after completed their 20 overs of batting, England reached a total of 193-7, but it wasn't enough to win, as South Africa won by 3 runs. This was a very competitive match, and England have nothing to be ashamed of. They almost slayed the South Africans, but they just couldn't get to their target of 197. South Africa now look on to the final of the World t20 tournament, but the big question is, can they get the job done and become the 2014 World t20 champions? Be sure to give your thoughts in the comment box below, and thanks for reading! A report from South Africa's Twenty20 World Cup win over England.